Work crew in Drepung, Tibet. Photo: Preston Rhea/Flickr, 2010 (http://bit.ly/2CqAPRf); cropped. CC BY-SA 2.0 (http://goo.gl/mMLnuj). 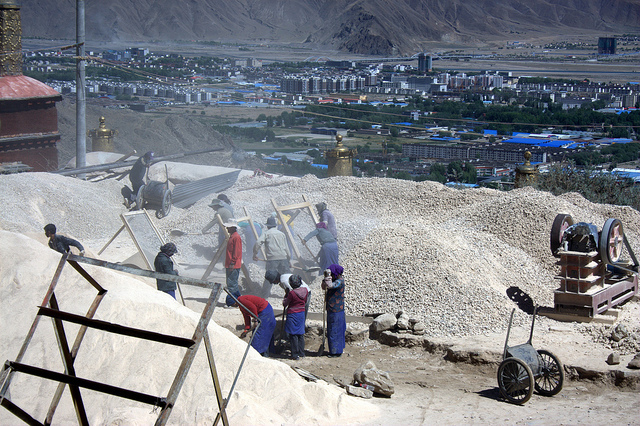 This panel explores the impact that development is having on social formations and everyday geographies across Eastern Tibet, where developmental outcomes are increasingly disrupting the rural/urban binary that has been foundational in framing scholarship on Tibet. Over the last decade, scholars have increasingly explored the economic and social transformations occurring in Tibetan regions of China. Evolving government policies are putting more stress on rural enterprises and encouraging the pursuit of opportunities that are clustered in growing urban areas. This research has complicated assumptions that development and urbanization necessarily lead to rapid assimilation. Because state development has been so effective in creating new infrastructure and venues for living and working, the traditional rural and the modern urban now strongly interpenetrate. Everyday life in Tibetan areas is entwined with regional, national, and global cultural and economic trends (see Sułek and Ptáčkova 2017). In urbanizing places, Tibetans are altering and appropriating the materials and discourses of 21stcentury Chinese development policies in order to further community and monastic interests (Kabzung and Yeh 2016; Makley 2018). Furthermore, some Tibetan autonomous administrations are looking back to socialist work provision in an effort to reduce social instability (Fischer and Zenz 2017). The papers in this panel further explore the contemporary reconfiguration of Tibetan society. Papers follow new lines of inquiry including emerging status divisions within Tibetan communities, circular migration between cities and villages, “urban” lifestyle expectations in “rural” areas, and the role of contemporary administrative units in articulating notions of Tibetan historic place.